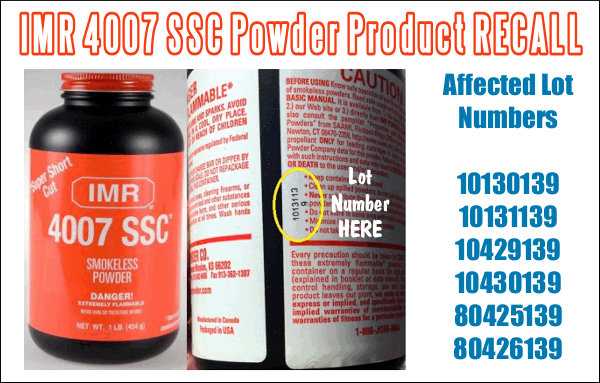 IMR Legendary Powders is officially announcing a product safety warning and recall notice for IMR 4007SSC on the six lot numbers listed below. IMR has received reports that this particular powder in 1-lb and 8-lb containers may have become unstable due to possible rapid deterioration. Use of this product from these lot numbers may result in spontaneous combustion, fire damage or possible serious injury. 1. Stop using this product immediately! Fill the powder container with water which will render the product inert and safe for disposal. 2. Mail, email or fax a copy of the powder label showing the lot number to the contact information below to include your name, address, phone and email. 3. Replacement choice of any other IMR smokeless powder product will be shipped to you for no charge. 4. If you have loaded the powder subject to this recall into ammunition, we recommend that you pull the bullets, remove the powder and wet the powder with water for safe disposal. IMR deeply regrets any inconvenience this may cause, but we believe in safety first. Contact information: IMR Powder Company, 6430 Vista Drive, Shawnee, KS 66218, email help@imrpowder.com, imrpowder.com, call 1-800-622-4366 or 913-362-9455 and fax 913-362-1307. Share the post "IMR 4007 SSC Smokeless Powder Safety Warning and Recall"
Yes, I do have a LB of this powder, I have about 100 rounds to pull. Can you replace this with ANY REM 223 powder?? I live in Canada and have some IMR 4007 SSC. When it is sold in Canada there is an extra label put over the manufacturers label that covers the lot number. It is impossible to remove it without destroying the label with the lot number on it. Any suggestions on what to do?